For many years the ordeal of Daddy’s Homemade Bread was just a part of life in the Jolly household. It’s a mystery exactly where he got the recipe (which you'll find in the "Bread" section under the My Kitchen Tab .) Even more of a mystery is how or why this west Texas farm boy ever got started making bread in the first place. After all, at no other time would you find him in the kitchen, and aside from manning a backyard barbecue grill, this was his only culinary endeavor. But regardless of how he came to love the sport of bread making, it became something of a sacred ritual that remained virtually unchanged for more than twenty years. He’d be sitting in front of the fire on a chilly Sunday afternoon, watching the Dallas Cowboys play football on TV, when suddenly without warning he’d jump to his feet and announce, "I think I’ll bake some bread!” Up in the kitchen (I say "up” because our house was a split-level and the kitchen was about five steps above the den) the process began with the accumulation of various enormous bowls. Never one to do things in a small way, he always tripled the recipe and made at least six loaves at a time. Daddy seemed to delight in the transformation of simple ingredients into a tangible substance. He loved kneading the wet sticky mixture in mounds of flour, and he loved shaping the pillow-soft dough into loaves which he slathered in oil before putting them to rise in bowls lined up along the hearth in front of the fireplace. As the yeast worked its magic, the whole house was filled with a heady aroma that became almost unbearable by the time the bread went into the oven. Finally, after hours of labor the crusty loaves were brought forth. Thick slices smeared with a generous layer of butter proved that the ordeal had been worth while. The best part for Daddy, though, was wrapping the loaves up in clean cup towels and delivering them, still warm from the oven, to a few surprised and delighted friends and neighbors. 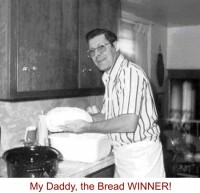 Just as surely as I inherited Daddy’s sense of humor and (unfortunately) his nostrils, I also inherited his joy of baking bread. It is a tactile sensation that feeds my soul like no other. As far as I’m concerned, it isn’t the end result but the experience of homemade bread that offers up the best rewardI. For that reason, I wouldn’t have a Bread Machine if you gave one to me, and if Daddy were alive today I’m certain he would feel exactly the same way. I still have the little grease-smeared index card on which I copied down the original recipe just after I married. At the bottom, in Daddy’s hieroglyphic-like handwriting he added, "If it’s a success, remember I love you. If it's a failure, I love you 2”. I wouldn’t take a million dollars for that little card. Nor would I take a million dollars for all the sweet memories of Daddy’s Bread Making Day! Search for Around the Table articles similar to "Knead I Say More?. Search all articles similar to "Knead I Say More? ".